Liz Corbin, a researcher of materials and process based at the Institute of Making, reports back on her experience whilst #LivingTheResearch in China. It is day four of our tour of Chinese maker culture, and we have already paid visits to incubators, factories, supply chain management consultancies, industrial design houses, co-working spaces and public workshops. The diversity of these spaces has made it difficult to clearly decipher what the term ‘makespace’ means in China but it is clear the maker culture here is characterised by a wider, integrated manufacturing ecology. For me, the difficulty in defining Chinese maker culture does not come as a surprise; in my own research it has proven exceedingly difficult to define the UK's counterpart. I am one of the academics on this trip, based at UCL’s Institute of Making. I spend much of my time facilitating Open Workshop, a growing network of 40+ public workshops currently operating across London. London’s makespaces, and open workshops more broadly, function as hubs for the city’s vast making community. Hobbyists and practitioners alike are coming together to share knowledge, resources and skills on a hyper-local, regional and global level. The localities of public workshops have enabled local communities, creatives and industrialists to overlap and connect –seeding new ways of working and socializing together. And the structure of such spaces enables them to be adaptive and responsive to local markets and communities –addressing real needs and gaps within London’s communities, responding to them inclusively and often far faster than conventional models. Mosaic, printmaking, robotics and set design - Open Workshop is diverse. Within the collective there are more than 24 disciplines and over 125 different types of tools. The incredible diversity of Open Workshop is, to a large extent, a symptom of the city’s rapid redevelopment. Across London the spaces where people can make things are being exponentially squeezed, increasingly leaving public workshops -with their affordability and shared facilities - as the last refuge for our vital manufacturing and creative industries. Located on the other side of the world is a city with a palpable and thriving manufacturing ecology. A young city in the eyes of many, contemporary Shenzhen is rooted in 1979’s wave of immigration, which saw both individuals and families coming to the city from across China in search of work. It’s a city with a young cultural heritage but, importantly, founded on entrepreneurial spirit and vigour. To echo Cat Rossi, my preconceptions of Chinese production have been greatly influenced by the media's portrayals of piracy and inhuman production practices. Yet, now that I’m on the ground and experiencing elements of Chinese manufacturing practices for myself, I’m beginning to understand the true creativity, communality and entrepreneurialism of Shenzhen’s maker culture. Embedded within the manufacturing culture of Shenzhen is a system of trial, error and experimentation. It is an integrated ecosystem based upon rapid, flexible iteration and open source culture, one increasingly referred to as Shanzhai. The Shanzhai ecosystem consists of thousands of companies that manufacture and distribute goods. 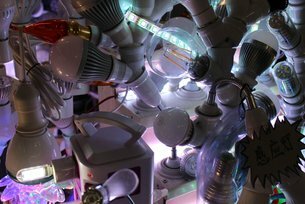 It is one that celebrates, fosters and enables open source R&D and innovation –a resonance not far from what is found at the core of our own maker culture in the UK. The open R&D and modular design characteristic of Shanzhai seems to be affording Chinese makers the flexibility to mix and match both hardware and software to quickly put together their own innovations with customized functions for various niche markets and hyper-local community needs. Could we soon see many more designers from all over the world come to Shenzhen to harness this vast, open and experimental manufacturing culture? Indeed, it’s already happening. I applied to take part in Living Research in the hope that I might, through comparative insight, develop a richer perspective of the UK maker culture - how I might be able to place the phenomenon within a wider global context, as well as the opportunities Open Workshop may have to expand its available resources. Throughout this week, we have to equal measure been subjects of study ourselves. The makers we have met have asked us as many question as we have of them. What do UK makers make? How do they prototype? What do their design practices look like? The superlative question remaining, how might collaboration be possible? It is clear the makers of Shenzhen are keen to offer the potentialities of the new Shanzhai to UK makers. While admittedly, the idea of an efficient distributed manufacturing system remains a question for many UK makers and academics, it is apparent it has been a reality here in Shenzhen for quite some time now. How might we be able to learn from this? Can the forging of relations between the two cultures co-evolve towards mutual benefit? How might this co-evolution affect the way in which technologies and products are created, produced and used? The trip has been an incredible experience thus far and I have learned a great deal from both my travel companions and the makers we have met. I look forward to learning more over the next nine days and reporting back on our findings. I would like to extend my gratitude to the AHRC, British Council, Nesta and the Newton Fund for making this trip possible, and to David Li, Luisa Mengoni, Rone Ltd. and Seeed Studio for patiently answering my incessant line of questioning. Liz is a participant on 'Living Research: Making in China', helping us to understand Chinese maker culture through practical creativity and collaboration. We profile the five UK based makers and four UK based academics, who are going to be immersed in Chinese maker culture during October 2015 as part of our 'Living Research: Making in China' programme.